SNAFU! : Taiwan acquiring 30mm cannons for its CM-32 Clouded Leopard as 25mm found to be inadequate. Taiwan acquiring 30mm cannons for its CM-32 Clouded Leopard as 25mm found to be inadequate. Taiwan has ordered the Orbital ATK 30mm Mk44 Bushmaster II cannon for an indigenous wheeled armored vehicle program, according to its Ministry of National Defense. The contract for 285 automatic cannons, valued at $112 million, was issued on Sept. 27, according to bid documents seen by Defense News. The ministry announced it two days later. The automatic cannons will be used on an infantry fighting vehicle, or IFV, variant of the CM-32 Clouded Leopard 8x8 armored vehicle. 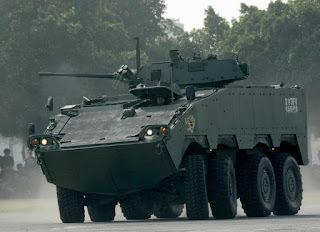 Ministry officials were quoted by local media as saying that the cannons will arrive “soon” with mass production of the IFV expected to start by the end of the year. Taiwan’s National Chung-Shan Institute of Science and Technology will be responsible for designing a two-man turret incorporating the cannon for the IFV. The cannons will be integrated with charge-coupled device cameras and mount a 7.62 mm coaxial machine gun, according to the ministry spokesperson. Taiwan had originally intended the IFV to be fitted with the 20 mm T75 revolver cannon combined with improved armor-piercing ammunition. However, Taiwanese sources told Defense News that inadequate performance of that weapon in tests led the country to seek a heavier weapon instead. First. I think the article is wrong. I'm pretty sure the vehicle is currently mounting a 25mm cannon. Second. This is pretty stunning news and we haven't seen similar testing by the US Marine Corps or Army on the same subject. Is the 25mm cannon as mounted on the LAV-A2, and Bradley even competitive anymore or do we need a crash rearmament program? Everyone and their mother has stated on this blog that 30mm is now the MINIMUM caliber necessary on the modern battlefield. Our allies seemingly agree. Has the US fallen behind in this area too? Note: If you know of published tests that escaped my attention I'd love to see them!